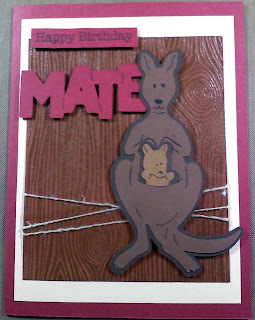 My uncle is from Australia so I made him this card for his birthday. I was so excited to use that wood grain background stamp. I finally found one at Michaels and it was on sale 40% off! Jackpot!!! I then clear embossed it and rubbed Red Brick Tim Holtz ink on it to add in some red coloring. The Kangaroo & MATE cut is from the Animal Kingdom cartridge.